Most of the sensors detect opening of a door, window or breakage of glass or movement of human beings. But it is equally important to detect if there is a break-in attempted through walls, ceiling or floors. This can be detected with the help of vibration Detectors. The detector operates on the principle of resonance of frequency. When the external impulse frequency due to hammering or chiseling matches with the resonance frequency of the sensing element, the alarm is triggered off. False alarms are avoided with proper setting of the intensity controller. The vibration detector can be fitted to windows, door frames, walls, ceilings etc. A typical vibration detector is effective up to 2.5 meters depending upon its location and the material to which it is fixed. 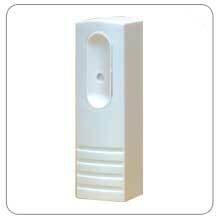 Each detector can set to its own optimum level of sensitivity. There should be a sensor for every 20 ft of wall accessible to the intruder. Sensitivity should be adjusted to suit local vibration requirement.